The door and gate are the first impressions which greet any visitors to our house and a stylish and modern door and gate would surely whet the appetite of what is to come behind the closed door and gates. For us, we didn't want to retain the passe looking doors and we loved the doors that we saw in many private apartments and wondered to ourselves how come that was a rarity within HDB flats. We felt that doors and gates are like accessories to a house and give the house a 'wow' factor.For us, it would be difficult to call one's home modern comtemporary when there is an unsightly HDB wooden door smack in the middle which would break the seamless decor theme of the house. To get that modern stylish look, we decided to divert some funds to the purchase of a new main door. However, the standard doors available were not to our liking as they were too traditional with the usual patterned carvings or painted wood design. Thus, we went to a door manufacturer to customise our own door according to our design. We met Jonas from Contat Decor and Transportation who was very friendly and provided good service, explaining to us what went into making a door and showing us all the door parts, material and designs available. Over 3 trips, we discussed with him our requirements and spend time with him discussing the different parts of the main door from the wood lamination to the lockset to the handles etc. (Above) Chrome and stainless steel pull handle. We chose area of pull handle where we will be grabbing to be in matte finish so that there won't be smudging and fingerprints. The top and ends of the handle where we don't usually touch, we left in chrome to give it a classy look. 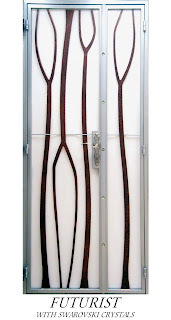 We spent about 780 dollars on the entire main door, doorframe and the door parts such as the lockset, handles etc ( we took the more expensive route of equipping the door with YALE branded items instead of cheaper Taiwanese or China sourced locksets for security and reliability ). It was a worthwhile splurge for us as we feel it complements the contemporary modern look of our apartment. You can contact Jonas at 64425270 or email at jonas@contatdecor.com for more details. (Above)The MAH Door locking knob for the Yale Anti-drill locking cylinder to enable locking and unlocking of the door. Advantage is easy to lock by just twisting knob instead of having to insert key to lock from inside and the door will never slam shut on you with your keys inside the house. However , this means you cannot slam shut the door so you will have to remember to use the key to lock the door when leaving your house. Normal doors will just slam shut. 6) Need for a door stopper. For those who are keen on a large vision eyeviewer where you can view from a distance, a person standing outside the door ,without you having to peer into the eyeviewer, you can contact Jonas. Very quirky and interesting! We chose a simple design combo of horizontal bars and wood paneling known as the Zen model. 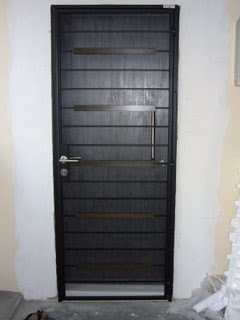 We requested that the gate be sprayed black to blend in with the dark couloured doorframe and main door. We especially like the fact that the gate has padded edges to esnure a quiet and smooth closure of the gates. We also used Gayle's suggestion that the gate be framed as a single piece instead of the conventional 2 piece door design shown below which means that the entrance opening is smaller making entrance more difficult, which does not make sense for HDB flats since HDB entrances are smaller than those in condominiums. In choosing the gate design. we found that adoption of a single piece gate design (see picture of our new gate) which allows for a bigger opening clearance and entrance, enhancing ease of entry through the gate. As HDB flooring is not level, do note that there will arise a situation where one side of your gate frame will have to be longer than the other side to ensure a straight and level fit. You can see closely that our corridor flooring is not level. This is a HDB design that allows water along the corridor to flow down to the drainage gutter. We also specified that we wanted a clean cut modern straight handles instead of the usual curved patterned designs which are not to our taste. The handles are from VRH, a regional based company well known for their door lock products. The locking system and anti-duplicate keys are sourced from Makoto of Japan. We specified for horizontal wood panelling (above) on the gate since our main door was slim as vertical lines will make the door look even smaller. If you are changing the main door like us, do look for a gate design and colour that will complement. Revamping the entire flat to remove the drab feeling with a modern look has been a most satisfying experience where you see what you planned and discussed become reality. In this post on the revamp of our kitchen, we share some tips on kitchen design. At the end, we hope that those who used to give resale flats a miss will be able to see that every old flat can be given a new lease of life as long as you permit yourself to imagine and consider the possibilities! We remembered the first time we set foot into the kitchen. It was really oily, mouldy and sticky as the previous owners, being an elderly couple could not physically manage to maintain the kitchen. We were however impressed with the length of the kitchen and decided that the kitchen cabinet had to be shifted from it's original position to the opposite side to provide one seamless kitchen cabinet arrangement. This would also align the customised washing machine base for the washing machine to be in line with the washing machine drainage pipe outlet. At that time, the washing machine was placed with the original cabinet outside the toilet with an unsightly drainage tube protruding out. We also decided to demarcate the wash area from the main kitchen area with a customised laminated panel to provide some privacy so that undergarments etc. will not be on public display when there are guests in the house. To ensure adequate lighting for the kitchen, we marked out the work areas of the kitchen, namely 3 areas - sink area during washing, hob area during cooking and cutting, microwaving areas. Thus we positioned our lights in these areas. We also noticed that downlights were needed to light up the kitchen cabinet table top areas to provide more focused lighting for cutting, food preparation. The next thing is to consider safety. Choose a kitchen tile that is easy to maintain and is not slippery. For us, we used a bathroom floor tile for our kitchen so there is good grip even when we wash the kitchen. A factor in enhancing the practicality of a kitchen is to consider the amount of table top space you require which is in relation to what are the appliances you have that will take up such space. For us, we had to extend the kitchen by 4 feet to house the microwave oven(above). We did not take the usual route of customising an enclosed housing for the microwave oven as it is not good for microwave ovens as they require a clearance space of min 10cm at the back and 5 cm at the sides to cool as they radiate alot of heat. An enclosed area would result in a built up of hot air which will over time damage the oven. You will also have to consider the placement of your appliances to relate to the location of your power sockets and the number of such sockets that you need. Also do look into the wire length of your appliances when you locate your powerpoints. Two cheaper ways to extend even more kitchen top space for us was to use LACK shelving from IKEA. See below which we used to double up as top space to house the bread box and spare table top space to act as an interim bar counter for one person to makan. You can see below where the Lack shelf meets the table top. We painted the wall black so that it would look like a seamless fit with the kitchen cabinet. We also bought a console table (below)from Mondi which fits in with the black glossy theme of our kitchen to create further table top space for out toaster and electric kettle. We decided to create a focus point for our kitchen while extending the primary colour scheme of red and black into the kitchen through installation of red sprayed glass backing which are far more manageable than the popular stainless steel or tiles( tiles have grooves where grease tend to get trapped and accumulate) The red backing lends a sophisticated charm to the kitchen and brightens up the area. We also had a open shelf built(below) beside the top dry rack for Gayle to start her cook book collection. If you can do consider choosing a solid top that blends in with the colour of your sink so that it appears to be a seamless fit like ours. ( above) as the wall was within close proximity. Even for the main door for the non chill section, there has also to be enough clearance space for the door to extend fully to allow for the drawing out of the chiller tray(below). This is particularly so for those couples who want to make a kitchen cabinet housing to house their side by side doors fridge or have walls or beams in their kitchen that may prevent the full opening access of the fridge doors. Another point is to check and confirm the location of your appliances and relate it to the location of your powerpoints and switches. You should also check the length of the wire of the appliances that you use to gauge the height of the switch and socket locations/sockets. Do check that the fridge does not block your access to the sockets otherwise you will have difficuly switching off the fridge(eg during cleaning or defrosting) or using the additional socket for other appliances. For the wash area, we estimated the amount of workspace we required for comfortable movement within the wash area. We also asked for the kitchen cabinet to be extended into the wash area to cover the exposed water pipes and also to provide shelving and storage space for items like wash powder, pegs, detergent etc. As mentioned earlier, we asked our ID Jacky to build a laminated panel to act as a 'wall' to demarcate the kitchen and wash areas while providing some form of privacy and for aesthetic reasons , to block out a full view of the laundry from guests. (Above) The Black glossy laminated panel that acts as a demarcation wall for the kitchen and wash area. We like the gloss as it creates a classy feel for an otherwise mudane wash area. You will also need to think about the ceiling space of your wash area when considering whether you intend to install any laundry systems or reply on the traditional bamboo poles. You must ensure that there is enough height clearance when the laundry system is raised and when it is lowered or extended. Furthermore, do check that it doesn't clash with your wash area lighting location. We installed a pulley system Easy Hanger for our laundry drying from HomeNiche Pte Ltd who are supposed to be the original manufacturer. We had explored other cheaper alternatives, some as cheap as half the price of what we paid( we got ours at $398) but these appeared more flimsy, did not have pulley systems that were smooth to operate, had 4 poles instead of 6 poles and what's more, our poles are stainless steel, so less chance of rust, quite important since the poles are exposed to wet clothes laid out to dry. You can visit them at 10 Jalan Kilang #01-02, Sime Darby Centre - tel: 62738005. We are pleased with our kitchen. We managed to create our desired kitchen as one that fits in with our requirements for cooking and day to day practicalities while at the same time, putting in some touches to soften the kitchen and make it a more stylish area that blends in with the decor sand theme of our home. We managed to create a DIY modern ,clean and glossy apartment number sign for our house. We sourced the lettering and numerals plus the plastic backing from a supplier. Total cost is about $40 inclusive of the customized cut plastic backing(comes with 3M adhesive tape) for 7 pieces of numbers and a doggy chrome piece. Heart shaped chrome piece is also available.Posted is a picture of a similar sample we did for a friend. Granted, it is not cheap but for those who are particular about modernity, well , these are the little bits that count.Those who are keen to purchase this sign can email me at blissndreams@yahoo.com.sg for more details and to place an order. Cheers. In line with the contemporary look, we have been scouting around for pieces of accessories to make the house feel distinct/ For example, we sourced from Molecule Jamesthe Book End to support the books on our shelf in the study. We sourced from Lightcraft 2 pieces of very contemporary designed lamps for our bedside tables. The silver glint and the unconventional square design of the lamp provides a fit to the contemporary look of the master bed room. Price was about $90 per lamp. More rectification works this week. As we cleaned and looked around the house, we found certain areas that were not quite up to the mark and asked our ID Jackie to rectify ( ie paintjob - certain corners not painted throughly , silicon in certain areas require laying, scratches on some lamination in the cabinets ) Expect much of this detailing towards the end of the renovation phase as the focus shift on completion of renovation to works inspection before final 10% payment and handover. We also asked for the doors of the kitchen cabinet to be adjusted so that the gap between two doors is a precise fit. Our grey coloured sofa from IKEA arrived this weekend to help complete the look of the room. As mentioned before, this would be a lazy hang out leisure corner for us and any guests within a cozy setting. We bought a white side table from IKEA to complement the sofa. A Orange circular motifed quilt was also sourced from IKEA and laid over to provide a complementary and soft look for the sofa. To give full play to the play of light and shadows in the orange room, we changed the bulb from a frosted one to a clear one which allows the light to shine through and cast an inter-play of patterns to the room. To brighten up the white wall along the kitchen, Gayle decided to buy a contemporary art piece from IKEA. It helps to lessen the 'domestication' image of the kitchen and give it some flair. We called the friendly folks from Tan Seng Hua Gas Supply 62895554 to install the SPC gas cylinder and gas regulator to the Rinnai hob as our block does not have piped gas. The uncle - Mr Tan was very friendly and showed us safety aspects of the regulator and was impressed with our hob as it has a built in gas detector that automatically shuts off the gas if it detects the flame has been extinguished.